What in the World is Nutritional Yeast? German Lebkuchen – Vegan and Gluten Free! Vegan Walnut Ginger Pear Crumble – Gluten Free! Carrot Coconut Oat Muffin – Sugar Free! Carrot Oat Muffins – Gluten Free! Zesty Lemon Hummus with Basil Pesto! Pasta and Veggies with Tomato Sauce – Gluten and oil-free! Make Your Own Coconut Walnut Milk! Make your own Hemp Milk! Pineapple Banana Carrot Smoothie Bowl! Apple Spice Cupcakes – Gluten Free! Chewy Coconut Cookies – Gluten free! Lemon Poppyseed Cake – Gluten Free! Orange Cranberry Cupcakes – Gluten and Sugar Free! Persimmon Spice Cake – Gluten Free! Fettucine with Basil Lamb – Gluten Free! Banana Peach Kale Celery Smoothie! 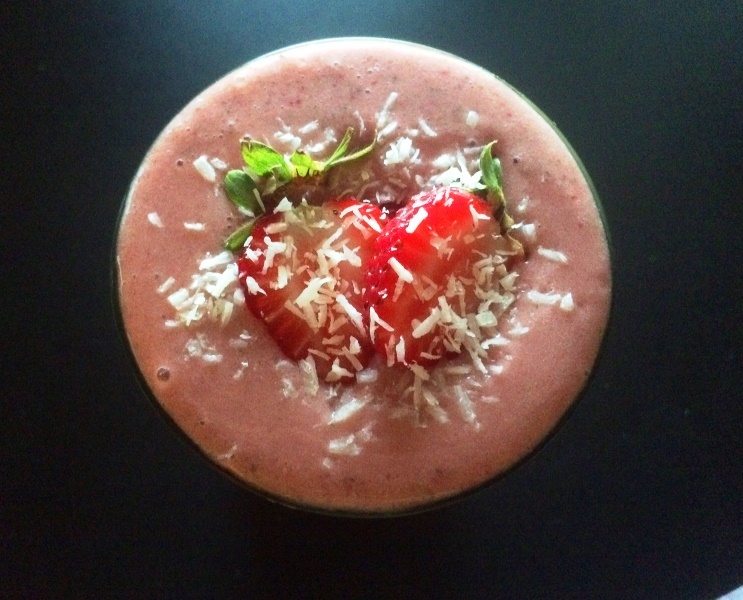 This smoothie is one of my new favorites! I made it as a pre-workout smoothie as I was feeling a little tired and low energy, and it worked GREAT as an energy smoothie and small meal replacement! 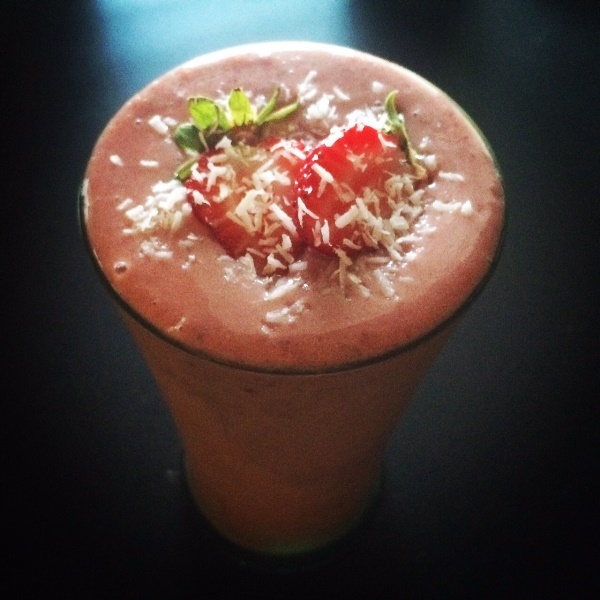 I made this smoothie with my very own homemade coconut milk, but you can use any kind of non-dairy milk you wish. Put all the ingredients into a high powered blender, and blend until everything is fully mixed and you have a smooth, creamy smoothie. If you need more liquid, add more coconut milk, coconut water, or regular water. You can also add more fruit if you prefer. 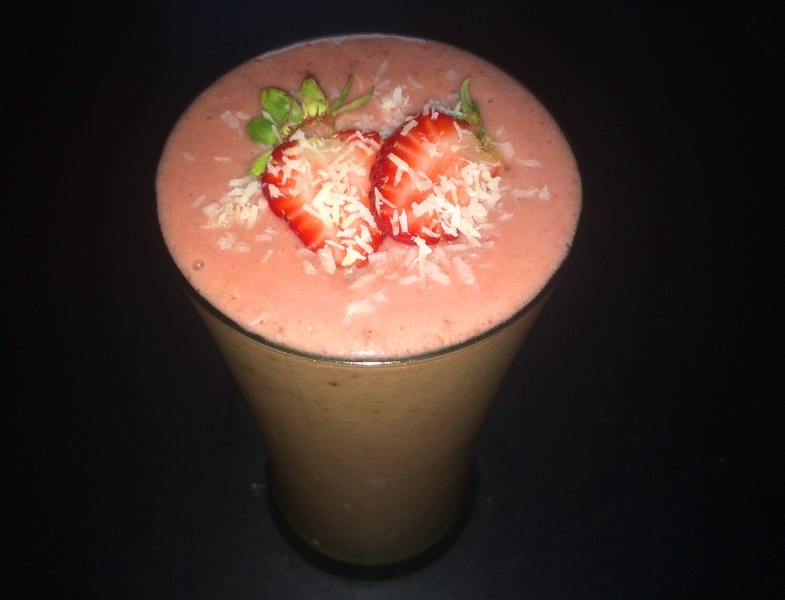 Once everything is fully blended, pour into a glass, top with fresh strawberries and some shredded coconut, and drink up! I also love the combo of strawberries-bananas-maca powder! Fabulous even! 🙂 MMMMMMM! RAWmarkably Creamy, Cheesy, Vegan Pasta! Make your own Almond Milk!